As expected market sold off as Job report came below 120k. Now the sell off would continue on Monday if Hollande wins in the France election. There is no major news till next Thursday, so rumor would dominate this market next week. Good thing about today sell off was that there was manipulation but it didn't cause major pullback and the volume was higher compare to other days. The first level to check on Monday in Dow for upside is 13098 followed by 13132 which is important break point for the upside. While for the downside, Dow needs to break 12993 followed by 13908. The first level to check on Monday in S&P500 for upside is 1375 followed by 1382 which is important break point for the upside. While for the downside, S&P500 needs to break 1358 followed by 1355. Dow started in bullish zone but at soon turned into bearish as job report was terrible. 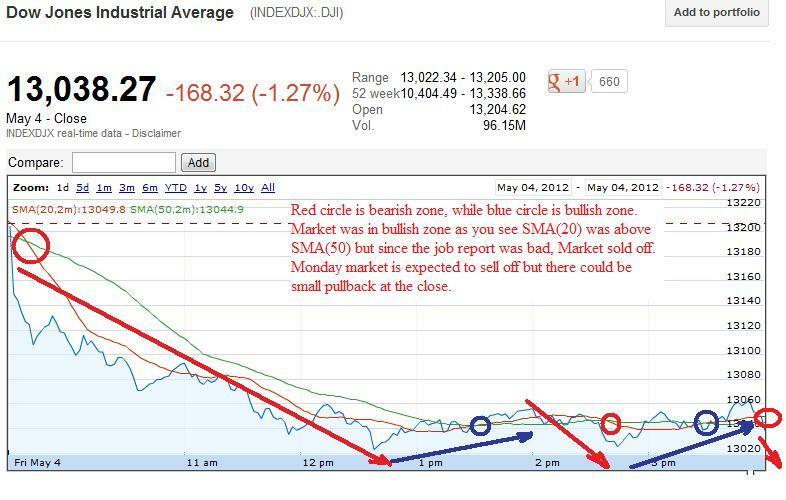 On Monday market is expected to open low and it will be another bearish day but there could be pullback by close. 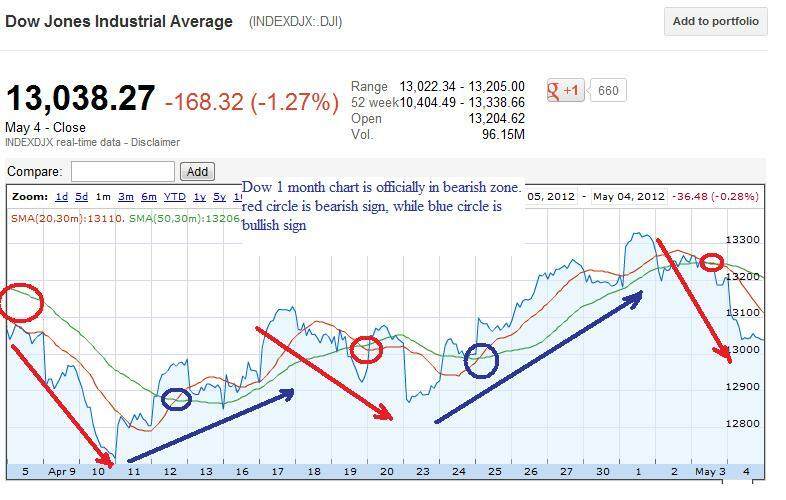 Dow 1 month chart is now in bearish zone. 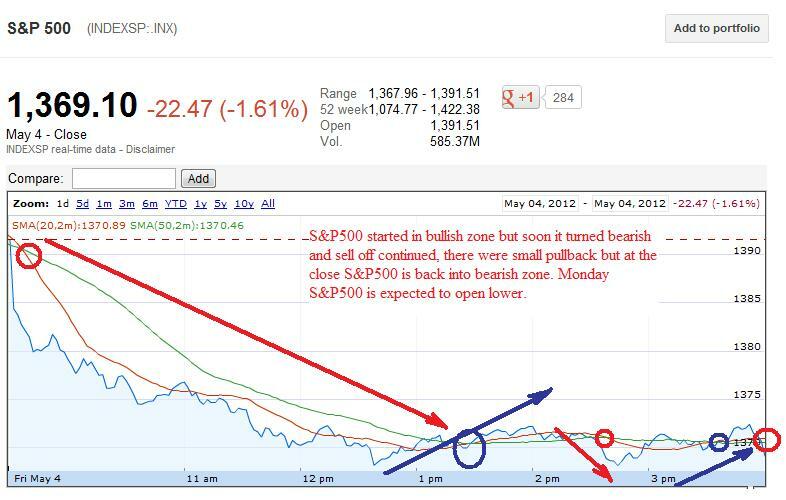 S&P500 is back into bearish zone by close and Monday another sell off is expected. 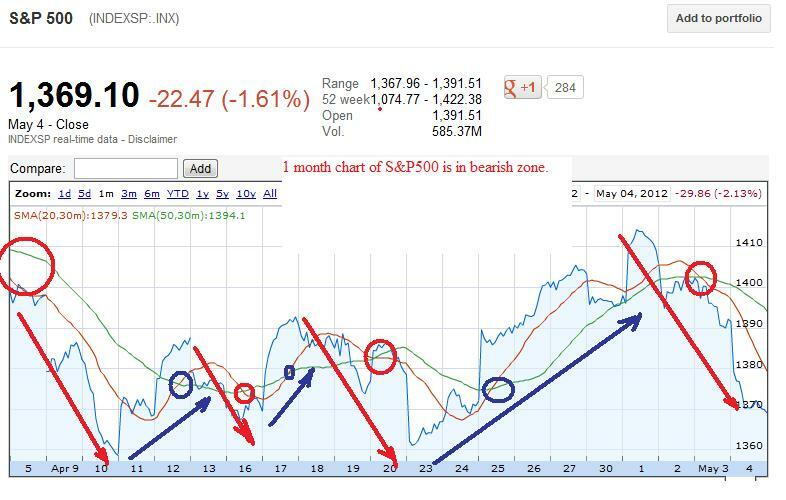 1 month chart of S&P500 is now in bearish zone. There is no economic data coming out on Monday. Things will dominate on the outcome of France and Greece Election. For Long term keep GMCR, PCX, RVBD, NOK, IDCC, DMND in your watchlist. For day trading watchout BIDU, AAPL, PCLN, MA, V, FAS, FAZ, TZA, TNA, TVIX, XIV, SVXY, UVXY, VXX (remember volatility is not a long term investment option use it for strictly day trading) VIX is still in contango so any rally in it would lead to sell off at close. So becareful with UVXY, TVIX, VXX. Long term investor should invest after Tuesday. 2% profit is better then 5% loss so sell as soon as your in profit. Good luck.